A solitary, robed figure stands alone. 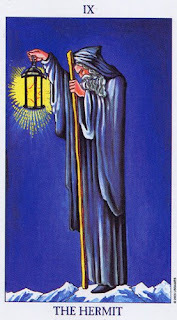 Staff in one hand, a lantern in the other. The landscape around him is barren and wrought with difficult icy peaks. His hooded head is downcast, seemingly searching for a sign in the dim light of the lantern, to lead the way. In his lantern shines the six-pointed star, the essence of which seems unattainable and unreachable. The six-pointed star is known in some circles and the Seal of Solomon. Made up of 2 triangles, one pointing up the other pointing down, symbolizing the axiom, as above so below. Just as one needs to engage in an exercise regime to keep the physical body fit and healthy, so too must one exercise the inner spiritual body to keep it conditioned so that we may benefit from its wisdom and guidance. 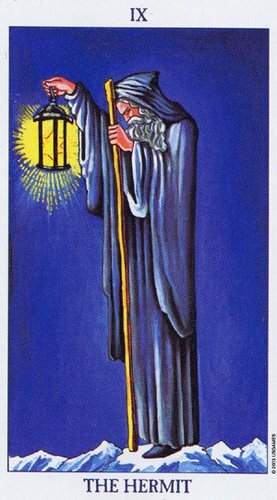 A Guidance – like the light from the lantern in the Hermit’s right hand - that illuminates the path when all around us is dark. The Dark night of the Soul is an ordeal often experienced by the seeker before gaining a higher consciousness and awareness. It is often a painful experience that requires courage and self-reflection and honesty to endure the ordeal. Many see this as an important initiation into the higher mysteries. As it is a necessary albeit painful step of inner reflection before we can step out into the light, in other words attain illumination. This reminds me of the story of the Egyptian god Osiris, who goes into the underworld every night through various ordeals to triumphantly resurrect again the next morning. It was Osiris who was cut into many pieces by his jealous brother Set that Isis managed to reassemble all but one body part, the phallus. She used magic to impregnate herself thereafter and thereby gave birth to Osiris’ son, Horus. The cycle being complete. This is the ordeal of The Dark Night of the Soul, experiencing a pulling-apart of ones soul, to be reassembled again once each part has been rediscovered. To be reborn with a fresh a new outlook, as symbolized by the newborn Horus. As spiritual beings on a quest for self awareness, this is a necessary ordeal to experience the reconstruction of the new you. Someone that has a fresh perspective on creation and destruction, for one cannot exist without the other. And you who seek to know Me, know that the seeking and yearning will avail you not, unless you know the Mystery: for if that which you seek, you find not within yourself, you will never find it without..